The America we live in today was born, not on July 4, 1776, but on December 7, 1941, when an armada of 354 Japanese warplanes supported by aircraft carriers, destroyers, and midget submarines suddenly and savagely attacked the United States, killing 2,403 men—and forced America’s entry into World War II. Pearl Harbor: From Infamy to Greatness follows, moment by moment, the sailors, soldiers, pilots, diplomats, admirals, generals, emperor, and president as they engineer, fight, and react to this stunningly dramatic moment in world history. Beginning in 1914, bestselling author Craig Nelson maps the road to war, beginning with Franklin D. Roosevelt, then the Assistant Secretary of the Navy (and not yet afflicted with polio), attending the laying of the keel of the USS Arizona at the Brooklyn Navy Yard. Writing with vivid intimacy, Nelson traces Japan’s leaders as they lurch into ultranationalist fascism, which culminates in their insanely daring yet militarily brilliant scheme to terrify America with one of the boldest attacks ever waged. Within seconds, the country would never be the same. In addition to learning the little understood history of how and why Japan attacked Hawaii, we hear an abandoned record player endlessly repeating “Sunrise Serenade” as bombs shatter the decks of the California; we feel cold terror as lanky young American sailors must anxiously choose between staying aboard their sinking ships or diving overboard into harbor waters aflame with burning ship fuel; we watch as Navy wives tearfully hide with their children in caves from a rumored invasion, and we understand the frustration and triumph of a lone American teenager as he shoots down a Japanese bomber, even as the attack destroys hundreds of US airplanes and dozens of ships. Backed by a research team’s five years of work, which produced nearly a million pages of documents, as well as Nelson’s thorough re-examination of the original evidence assembled by federal investigators, this page-turning and definitive work provides a thrilling blow-by-blow account from both the Japanese and American perspectives, and is historical drama on the grandest scale. Nelson delivers all the terror, chaos, violence, tragedy, and heroism of the attack in stunning detail, and offers surprising conclusions about the tragedy’s unforeseen and resonant consequences that linger even today. "Craig Nelson has completely retold the epic story of Pearl Harbor. Using his skills as a reporter and a literary stylist, he not only deftly paints the fleeting image—an enemy pilot waving as he flies by, a cup of coffee trembling on a table while outside a war commences—but a world roiled in titanic struggle. His gifts as storyteller, his empathy and scope, will appeal to fans of Walter Lord’s Day of Infamy or Cornelius Ryan’s A Bridge Too Far, and, in surprise, the inquiry of Lawrence Wright’s The Looming Tower. This book has a thousand poignant and unforgettable moments. You’ll read Pearl Harbor and want to pass it to a friend." 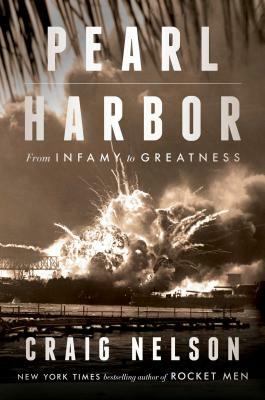 "Bookshelves groan with accounts of the 1941 attack on Pearl Harbor and its aftermath, but readers will not regret this thick new contribution to the literature. . . . Nelson weaves archival research, interviews, and personal experiences from both sides into a blow-by-blow narrative of destruction liberally sprinkled with individual heroism, bizarre escapes, and equally bizarre tragedies." "Nelson brings his formidable narrative talents to bear on this well-known history as he comprehensively contextualizes and covers the battle....To differentiate his work from the many previous volumes on this event, Nelson highlights the individual experiences of soldiers at the battle’s front and beyond. Nelson’s well written history of Pearl Harbor will be enjoyed by the general reader and appropriately highlights the battle’s historical significance." "Undoubtedly, we will read many stories about Pearl Harbor in the coming months, but this book is an invaluable resource for those who want to know the whole story."